Many website owners install Google Analytics in an attempt to gauge the success or failure of their online ventures. Unfortunately, it is all too easy to become overwhelmed by the data available, and to ignore the truly valuable statistics and the relationships between them. It is also very easy to focus too heavily on metrics such as unique visitors or traffic sources alone. Often what we should be really looking at is ways of improving our websites rather than how to drive more traffic to them. Luckily there is an easy way to use Google Analytics to delve inside the behaviour of your website visitors, which in turn can help us improve our webpages. Whether you consider your website a success or not, most sites can be improved upon in one way or another, either from a usability perspective, achieving higher conversions, or with regards to the goals set for each of your pages. An easy step toward trying to improve your sites can be achieved from using the data already previously gathered by Google Analytics but displayed via the In-Page Analytics report. This report adds valuable context to your data, perfect for anyone that has found it difficult to interpret analytics reports in the past. In this post we aim to cover the In-Page Analytics report, from explaining what it does, how to use it and offering some examples of how it could help your website. In-Page Analytics is a report in Google Analytics that allows you to see which links users clicked, thus allowing you to see how effective the links on your pages are and track where visitors go. It’s important to note that this tool shows you data for clicks to other pages on your own site, not outbound or inbound links. It uses your existing analytics data and therefore requires no setup or installation of new code, and you will find the In-Page Analytics report under the Content section in the left-hand navigation menu of your Google Analytics dashboard. Starting with your website’s homepage you are given a navigatable overview of your website, allowing you to visit each page on your site to get a different view of where people are clicking on your subpages. You can click on any link on your homepage and once the new page is loaded, the corresponding data is shown for that page. You can view this report in a widescreen mode by clicking the Expand button in the right hand menu, directly below the % Exit data. To go back to the regular view mode you simply click this button again, now the Shrink button. Each link on every page has an associated percentage displayed beside it within a small bubble. This number indicates the percentage of clicks on that link, and if you hover over the bubble you get a more detailed view of this data, where you can see exactly how many clicks there were for that time period. It will also tell you if there is more than one link on the page that leads to the same destination, for example, you might have links to your home page in both the header and in the footer. 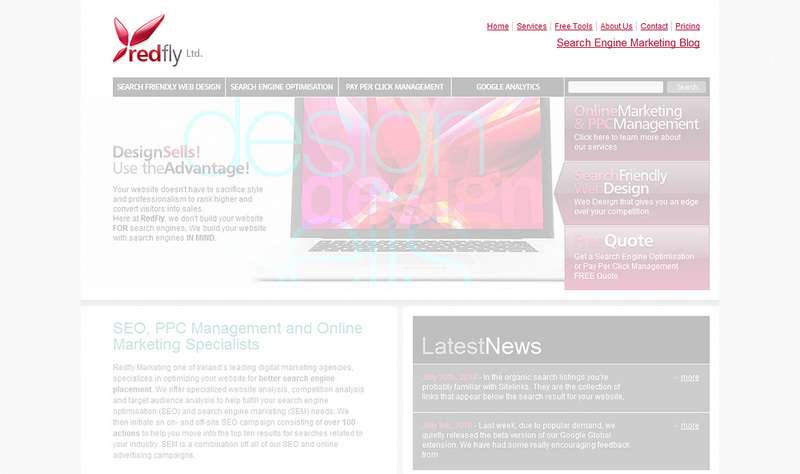 For more advanced users that wish to differentiate between these links, you can tag your links separately with ?ref= (for example https://www.redflymarketing.com/blog/?ref=footer) depending on which part of your page the link is located. To further differentiate between the different links, using the Color Bubbles button in the right hand menu, directly below the % Exit data, will display your data bubbles in either Blue, Green, Orange or Red depending on the level of percentage clicks. The highest percentage clicks are displayed in Red bubbles. A brilliant feature of the In-Page Analytics report is that it can tell you what percentage of clicks occurred below the fold of any given page. This is displayed in an orange bar on the bottom of the page overview. Alongside all of this click data you can also see Pageviews, Unique Pageviews, Average Time on Page, Average Page Load Time, Bounce Rate and Precentage Exit, all at the top of the report. Why Are Segmenting Options Important? All of this data is valuable by itself and for the entire group of site visitors. However, most website owners will know who their target audience is and business users will know which markets they want to focus on. It is therefore much more interesting to break down this data into different user groups, via segmenting. Within the In-Page Analytics report you can select Advanced Segments to break down the data being displayed, the same way you would in any Google Analytics Report. Advanced Segments allow you to select a segment of traffic in order to investigate how it interacts with a page. For example you can choose to look at New Visitors or Mobile Traffic etc. all depending on which user group you are most interested in. You can also select multiple segments to compare and contrast the behaviour of different groups and you can use the drop down box to toggle between them. So you can compare the behaviour of New vs Returning Visitors, or Paid Traffic vs Non Paid Traffic etc. You will find the Advanced Segments options open when you click the button located in the top left hand corner, below the Home tab. There are a number of default segments here to choose from, and you can choose four segments at one time to compare against. Each segment selected has it’s associated data displayed at the top of the report and you can toggle between the different segment click data (the percentage bubbles being displayed) via the drop down box, or by rolling over the percentage bubbles. One of the best features of segmenting is the ability to create your own segments based on almost any other metric, such as geography, duration of visit etc. This allows you to further analyse your data to great effect. To create a custom segment click the + New Custom Segment button. A favourite In-Page Analytics report of ours is a comparison between browser users. To create these segments we selected “Include”, “Browser”, “Containing” and started typing in the browser names until they appeared in the drop down menu to select from. Learn more about how to create advanced segments. To de-select one segment at a time from you report, you can remove it by clicking the x beside it’s name under the Home tab. If on the other hand you want to reduce the amount of data you are seeing, you can filter out links that have a small number of clicks. Using the drop down filter you can hide any clicks below a certain percentage, so you can focus on where most people are clicking. Segmenting can help you concentrate on your target markets and compare their behaviour to the norm, to help you make informed decisions about your content and design but you can already do this in the other Google Analytics reports. So what makes In-Page Analytics any better than viewing your other content reports? How is In-Page Analytics Beneficial? In-Page Analytics is a superior alternative to the Visitors Flow report found in the Visitors section, because although helpful, when looking at these reports you lose the visual context that your website gives you. However, In-Page Analytics adds context back to your data by superimposing it directly over your website, in doing so it better enables you to answer usability and goal orientated questions about your website. With the In-Page report you can look over any webpage and quickly make a decision visually about what links are working well and which links aren’t, helping you identify which content is popular on your website and which navigation links are most interesting. It can help you filter out useless content or reorganise your menu structure. This report doesn’t just show you what links are being clicked, it also shows you which ones are being ignored. It doesn’t just track where your website visitors go, it also shows you just how effective the links are. It can help you focus on what links need to be improved upon and it can help you improve your site, be it for the benefit of the user or to help your call-to-action achieve better success. Or you might be interested in whether your page layout is optimal for what you want users to accomplish on your page and if your users are seeing the content you want them to see. Most websites will show that the majority of clicks occur above the fold, and if this is case for you, make sure that you have all of your top action items near the top of the page. If you’re looking to optimise your page for different screen sizes, looking at the different percentages of clicks occurring below the fold of any given page can be helpful. The In-Page Analytics report makes these questions and more much easier to answer because you’re less bogged down in report after report. Even with analytics data it can be difficult to determine if your site is successful or not without an industry average for each metric to compare your results to. Using this report to concentrate on improving your site could be more beneficial then getting bogged down by the numbers game. Also, if you’re simply not a numbers person or don’t have the time to drill through your Google Analytics account then the In-Page Analytics report is for you, because the information is plainly displayed and easier to interpret. Examining the In-Page Analytics report for our own website we were very quickly able to contextualise and identify two pieces of data that we had previously overlooked, because both pages that the data relates to were receiving high volumes of traffic. One of the many goals of our website is to drive traffic to the Tools section, where we publish links to the Free Internet Marketing Tools created in-house by the RedFly Marketing team. Currently this page is host to two applications – Google Global (a browser extension that allows you to easily see what any Google search results look like from different countries and locations – watch this space for a new version of this tool) and The RedFly Keyword Manager Tool (a tool that enables you to quickly and easily create keyword lists for Google AdWords), and this page will be host to future apps currently in development. The goal of these free tools, along with the Online Marketing Blog, is to provide value to visitors of the site and highlight the skills of the RedFly Marketing team. Though the Google Global page has always received a significant amount of traffic, the majority of these visitors have found their way here from links posted off-site. Meanwhile the on-site link to the Tools section, located in the header, was not getting as many clicks as we would hope from our blog readers and homepage visitors. We concluded that these were goals we wanted to improve upon. In an attempt to improve the clickrate of this link, we simply changed the language of the anchor text, changing “Tools” to “Free Tools” to make the content of the landing page more obvious. After this change we paid close attention to the clickrate of this header link to see if there were any positive or negative changes, rather than focusing on the number of unique views to the tools pages themselves. When we looked at the In-Page Analytics report four months later we saw see a definite positive outcome to this subtle change, it went from 2.3% of clicks from homepage visitors to 6.4%, almost three times the original amount of clicks before this small change. Looking at the In-Page Analytics report again today, 10 months since the small anchor text change, this link is receiving 7.3% of clicks from homepage visitors. We are very pleased with the result, and continue to use the In-Page Analytics report for both our own site and client’s sites to gain insight into the links clicked, rather than the pageviews received. Here we were reminded of the valuable lesson that it is the quality of the traffic not the quantity that is really important. By having more homepage visitors and blog readers visit our Tools section we are closer to achieving our goal of providing value to visitors of the site and highlighting the skills of our team. The In-Page Analytics report allows you to pay attention to links that receive a low number of clicks, despite having corresponding pages that receive high volumes of traffic. Alternatively, paying attention to links with a large amount of clicks means making sure the pages that they link to are conversion optimized to their full potential, rather than wasting all that traffic. The second piece of previously overlooked information that we garnered from the In-Page Analytics report was that a high number of website visitors were clicking the link to our blog, whilst already on the blog page. We concluded that it is probable that our blog is in fact too integrated into the overall design of the site and that we should work to differentiate it. It also probably doesn’t help that there are three different links to the blog on the blog page itself. This usability issue is unfortunately not as easy to fix as the first example and we will therefore take more time considering this information, making small gradual changes to the design and monitoring any changes in click behaviour. For even more practical examples of how this report can help your site we suggest you read the article “What Makes Them Click? 7 Business Questions Answered With In-Page Analytics”. Before making any decisions as a result of the data displayed in this report, make sure to pay attention to the time frame you have chosen. By default Google Analytics will display data from the past month, it is beneficial to compare the click data of one month to another, or look at the data from over a longer period of time, and a larger group of site visitors. Also, this particular report is more suitable for websites with static pages. For example, the dynamic nature of a blog can make it more difficult to analyse as the main page is constantly changing, as new content is added. However it can work well with dynamic ones if you pay attention to the time frame you have selected. Also, if you were investigating the navigation of your blog, it’s important to consider that the In-Page Analytics report will only show you the current design of the site in the overlay, and if you had a different blog theme it would be wise to only choose the time frame in which you were using the current theme. In-Page Analytics gives you an essential visual overlay of your website, adding extra insight to your visitor behaviour, something that other data heavy reports lack. It allows you to focus on navigation and anchor text, helping you easily spot problems where you did not notice them before. However, until Google Analytics is able to differentiate between the same destination links on each page, the In-Page Analytics report will never be as accurate as paid services such as Crazy Egg and Clicktale, who both can provide you with heatmaps indicating exactly where users are navigating to on your site. Nevertheless, if you already use Google Analytics you can access the In-Page Analytics report with just one click, the data is already there waiting for you to look at and there is nothing to setup or install, and like the rest of Google Analytics, it’s free. Also, as mentioned above, if you really want to make the In-Page Analytics report work perfectly for you, then it’s simply a matter of tagging your repeated links separately in order to fix this issue, at least until Google comes along with a fix of their own. Despite it’s flaws, In-Page Analytics has been upgraded to a full report in the newest version of Google Analytics and continues to be a valuable tool to busy website owners and internet marketers alike. Hi Pramesh, really glad you found the post helpful. It’s surprising how much of a hidden gem the In-Page Analytics report is, I hope this post encourages more people to take a look at it. Wow Sinead, thanks so much I have been looking at Google Analytics and my eyes have been glazing over. I will definitely apply your suggestions and gage the reults. Hi Pauline, let us know how you get on. Really glad you found the post helpful. Thanks a lot Sinead — It may be easy technically to do the steps, specially after the screenshots explanations. But the good thing here is the you reminded us (me specifically) not to just “guess” where users may click, because that won’t work — and it’s the #1 law in marketing (“Don’t guess, research”). Thanks for your feedback WizIMS. It’s never a good idea to make guesses about your users, and putting the research in is even easier with in-page analytics. Sure, in-page analytic is good for tracking visitors. Excellent Post, thanks for sharing with us. your some tips are so interesting and useful. Thanks Marsha, glad you found it of help. I agree, looking at your bounce rate is import too, it’s a key indicator of how engaging your content is. Glad you found the article helpful. Thanks for your comment. Sinead, the truth is that I’ve only used analytics to count the people in my website, this is why it’s a good thing to keep reading, this is a good blog by the way. can only be useful for me thanks! I just found your page and read thru it. I am just now learning to use analytics and your information is going to help me in so many ways. Thank you for the lesson !! Hi Al, it’s well worth learning to use! Glad this post helped you. I personally use Google Analytics, and this report has opened up the world of In-Page Analytics! Hi Jack, really glad you enjoyed the post and found it helpful. Speaking of bounce rates, what are the benchmarks? What is considered a good bounce rate? Anyone? Hi Michael, there’s no standard answer to that one, as it all depends on the type of content. You should simply see it as something to always try improve upon. But within GA you can benchmark against yourself by using the ‘indexed against site average‘ feature, which easily shows badly performing areas. Right, bounce rate depends on the type of site as well as the industry you’re in. Generally speaking, a bounce rate that is less than 25% is considered great. 25% to 50% is good and above 50% is not so good. Also keep in mind that Google does factor in bounce rate when calculating your page rankings in the SERPS. Good piece of information for new comer like me, i really found it very difficult to use analytics but your post is great and simple. It made everything simple too me. Thanks Sinead. Hi Kevin, thanks for your comment. This post was aimed at people like yourself. REally glad you found it helpful. Very important to track your users to see how they engage with your site. You can see areas of the site where people leave and if you see patterns then you know something needs to change in that area of the site. Excellent post thanks for sharing knowledge. Really In page analytics is very much help full to tracking visitor. I was using Google analytic before but never had got result as expected. I followed your way and worked really fine. Yes, I think the analytics are very useful. I can found the bad pages on my site and I fixing them. Also useful is the in-page analytics useful where it says how many people percentage of clicks occurred below the fold of any given page. Thanks Sinead. I also use bounce rate to try and uplift pages that are not performing well. Regarding in-page analytics, I was not aware of the below the fold feature, thanks very much for the info. Great article, but we have been utilizing Google Analytics for quite some time, and at points find it a bit unreliable. Some of the statistics are not always accurate, particularly when it comes to the integrations of PPC campaigns and social media marketing. While we still trust and use Google Analytics everyday to hone our Internet marketing campaign, we have found some other, more precise analytical software out there, albiet a bit more expensive than Google. Still, a great and mandatory tool to anyone looking to successfully promote or market on the Internet! Great Article! One of the things that I’m finding is many businesses actually set up their analytics incorrectly from the start making in page analytics impossible to use. So I’d add that it’s highly important to have the www or non-www set up correctly in your analytics! and yes the analytics program does indeed track the visitor prefs. To date I had been using it chiefly as a gauge of the demographics.